During the NES era, two game companies released Ms. Pac-Man cartridges. The game was available from Tengen as one of their easily recognizable black unlicensed carts, while Namco released this licensed version. While the Tengen version included some upgrades in the form of extra mazes and new gameplay options, this release is a straight port of the original arcade game. The first thing I noticed playing this game is how slow it is. 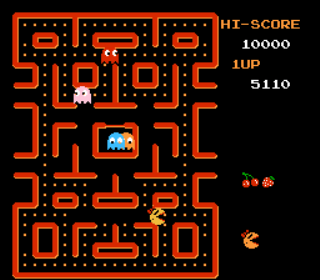 In the arcade, Ms. Pac-Man runs quickly at first, and only speeds up as the game progresses. This game starts off slow and stays that way, which has a big effect on the difficulty level. What would have been a split-second decision in the arcade becomes a “split-minute” decision at home. The only difference in subsequent levels seems to be how long the ghosts remain vulnerable after you eat a power pellet. Although the graphics aren’t bad, they aren’t quite as sharp as they were in the arcade. This is partly due to the fact that they shrunk the play field down to accommodate the 4:3 aspect ratio of home televisions. At least they kept the aspect ratio of the play field 3:4 instead of squashing it down, as most home ports of Pac-Man variants do. The music sounds at least as good as the original but I don’t care for the sound effects, which sound way off. Ultimately this isn’t a bad port of Ms. Pac-Man, but it is clearly the inferior of the two ports available for the NES. The extra features of the Tengen version may put off some arcade purists, but so will the slow pace of the Namco release. Tagged Arcade, Ms. Pac-Man, Namco, NES, Nintendo, Pac-Man, Review. Bookmark the permalink.